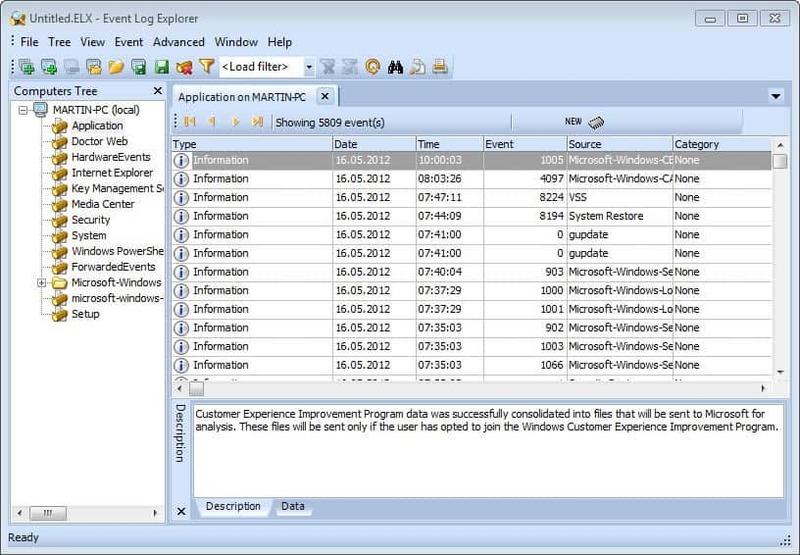 Back in 2008 we reviewed Event Log Explorer, a third party program to work with Windows Event logs, for the first time. Back then we found it to be an excellent tool for system administrators and users alike, to get the most out of the event log. The company behind Event Log Explorer, FSPro Labs, has just released version 4.0 of the application to the public. And while there is no change log, changes are noticeable right away after you start the program for the first time on your system. Before we delve into that, I'd like to note that the program is still available as a free version that you need to register with a free key after 30 days of evaluation. The only limitation of the free version is the limit to three computer systems. The program supports both the classic Windows NT log format and the new event log format. The first should display information a tad faster on the screen, while the second may contain additional information that the original log format does not include. You can select a computer system in the left sidebar, and once you do, you get to select the log format that you want to use, before you see all available logs displayed in a tree. A double-click opens the events in tabs in the program interface. The developers note that events are loaded into memory and optimized databases for high performance, with memory being the default option. You can configure to use databases instead for individual event types or generally. Event logs can also be loaded from file, for instance if they have been backed up. You can now browser, search, filter or print the current event log, or use some of the advanced program features instead. One interesting option is the option to create analytical reports. You find this under the Advanced > Analytical Report menu in the menu bar. 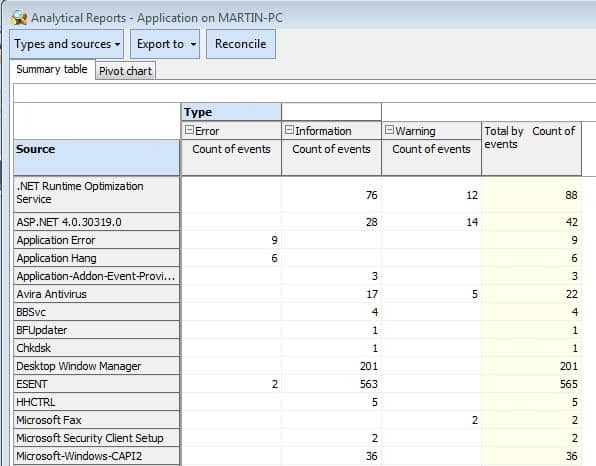 Here you can for instance create reports that visualize event IDs or event categories by user, the event type by date, or a event type and resource report. These information can then be exported to HTML, Excel or Word files. 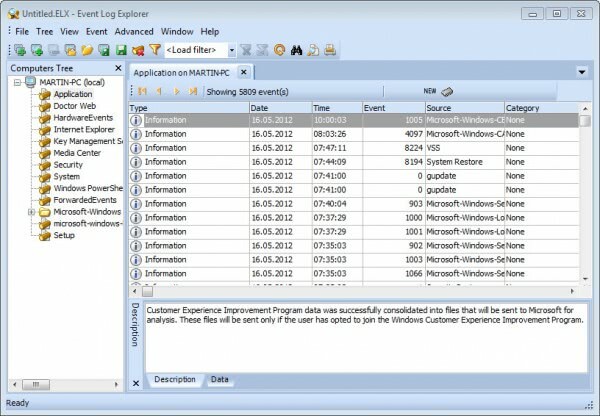 Event Log Explorer is a professional program, more suited for system administrators than regular users. That does not mean that it is unsuitable for regular users, as it improves the accessibility of Window's event log by a mile. When discussing event log monitors, you should discuss performance requirements. My experience with these products that monitor event logs over the network is that they frequently require dedicated machines because their performance is so bad. I tried out a number of these products for a client a couple years ago and it was truly a painful experience. While collecting or even processing the logs, a Windows Server 2003 system running on an older Dell Pentium 4 bogged down to the point of non-responsiveness. This is not what one wants from a single program designed to do just one thing. They also tend to be both ridiculously buggy, missing a number of useful features in analyzing the collected logs and the user interface is usually both inefficient and slow. Bottom line: It is REALLY HARD to find a decent log file analyzing system. I’ve used the free version of EventSentry for a long time. It doesn’t appear to have any overhead problems. There are a huge number of possible config options to choose from. What I like most about it is the ability to have it forward new event entries to my Outlook email. This way I don’t have to remember to search the event logs. I have been using Event Log Explorer for about 4 years and I didn’t observe any serious problems with performance or stability. + Option to display only new events after refresh. + Option to autofit columns after load. + Friendly view XML view of event (for new event api only). + Pivot charts in analytical reports. + Several UI improvement options.